Getting things done is easier when a team is all on the same page, so keeping individual to-do lists might not be ideal. 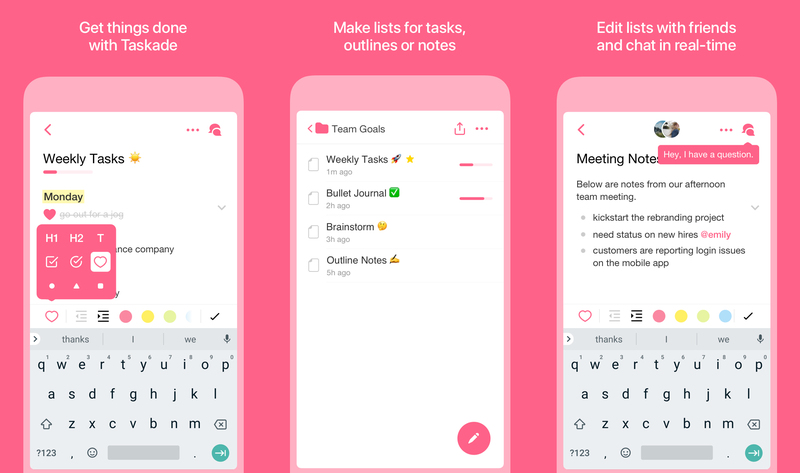 Taskade is a new app that seeks to make your bullet lists and random thoughts more collaborative with quick sharing and built-in chat features. It's free, too. Taskade supports multiple "groups," so you can have a group that's all your own. There are also sharing tools so you can invite others to a group. They just need to install the app and either sign up or log in with Twitter, Google, or Facebook. Everyone in a group sees the same to-dos in that group and can make edits or add new items. For communication, Taskade supports user pings, live chat, and hashtags for easy searching. Taskade is currently free with no ads or in-app purchases. The developers say that a pro version will be available soon with additional features including themes and stickers. What? You don't want stickers in your to-do manager?